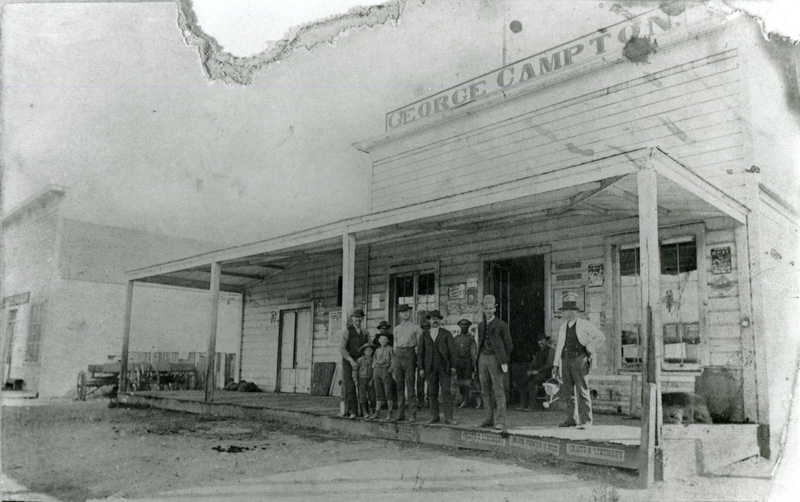 SCVHistory.com AP0615 | Newhall | George Campton's General Store. Born in July of 1839 in the British West Indies, George Campton emigrated to the United States during the Civil War and married a 19-year-old native Californian named Gregeria. He opened Newhall's first general store at the junction of modern-day Bouquet Canyon Road and Magic Mountain Parkway in September 1876. A year and a half later, Campton and the rest of Newhall picked up and moved two miles south, to the corner of Railroad Avenue and Eighth Streets. Campton's store housed the Newhall Post Office. Campton remodeled his store a few times during the 1880s and 1890s (after the move). This photograph shows the store the way it originally appeared in the late 1870s and early 1880s, with his name on a separate piece of wood above the facade as seen here. The building that's visible at left is Mike Powell's Palace Saloon. Further reading: George Campton biography in "Pen Pictures from the Garden of the World," 1889. AP0615: 19,200 dpi jpeg from copy print | Same as AP0414.